Frugal Eastern European farmers have always been known for nose-to-tail eating, that is, using every part of the livestock they butcher. Tougher cuts of meat end up in the braising pot to break down the connective tissue until all that remains is fall-off-the-bone-tender meat in a gravy iridescent with fat and surrounded by root vegetables. What, in common parlance, is known as a stew. These stews are often accompanied by noodles or dumplings or just good, multigrain or rye bread. Here are recipes for some of the top Eastern European stews. 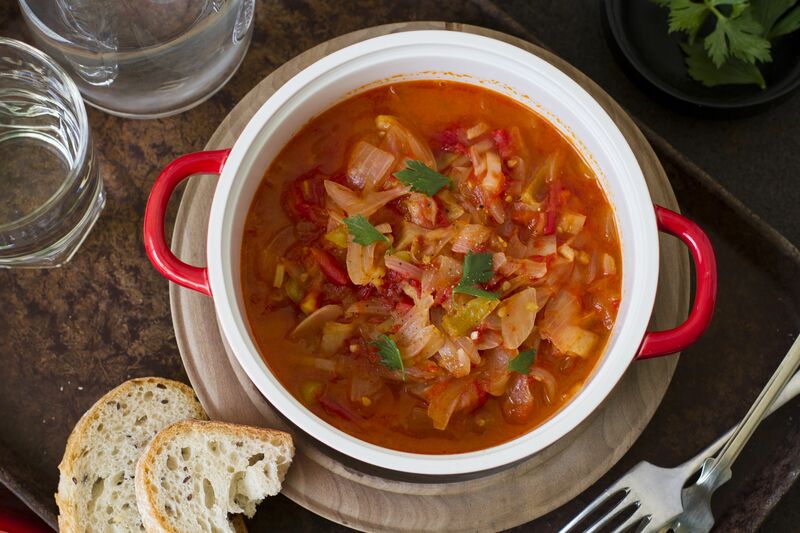 Hungarian lecso is a vegetable stew that combines three of Hungary's favorite ingredients—peppers, tomatoes, and paprika. Lecso can be served variously as a vegetable side dish, appetizer or the main meal itself. Lecso is similar to Serbian ​djuvece and Russian letcho. Bigos is considered the national dish of Poland. It's a hearty, long-simmered meat-and-sauerkraut stew that goes back centuries. It was traditionally served at the start of the hunting season, from fall through Shrove Tuesday, or until the family's supply of barrel-cured sauerkraut ran out! Today, it's enjoyed year-round. In the old days, it was full of the fruits of the forest—venison, mushrooms, dried fruits—but, today, anything goes. Eastern Europeans love oxtails and this delicious stew served with thickened pan juices and roasted potatoes fills the bill. In Polish, this is known as gulasz ogonowa, and in Hungarian, it is tejfölös ököruszály. This fast-and-easy Croatian shrimp stew recipe or škampi na buzara is an example of the rich seafood offerings along the Dalmatian coast that are influenced by neighboring Italy. Meals often begin with pasta or risotto, and then it's on to fresh fish and seafood in soups or stews. Leaving the shells on the shrimp when stewing makes for a delicious sauce just perfect for dipping crusty bread in. Hungarian Beef Goulash—Marha Gulyas—is another one-pot meal that comes together quickly if the ingredients are prepped the night before. It's ideal for a slow cooker, freezes well and tastes better the next day. Serve with noodles or dumplings of choice like csipetke or nokedli . This Croatian bean dish is known as grah i varivah. Some call it a soup, but it's so thick, it can be considered a stew. Any type of smoked meat or even sausage will do, but smoked rib meat is traditional and yields the best flavor. You can use a combination of dried beans, but cranberry, pinto or kidney beans are typically used. Serve with hearty bread and you have a filling meal, especially when there's a nip in the air. This recipe for Hungarian Chicken Paprikash—paprikas csirke—is from Chicago chef Gale Gand's mother, Myrna Grossman Gand, who inherited it from her own Hungarian mother, Elsie Grossman. Some feel this is "authentic" paprikash because it contains no green peppers and is served over rice, not noodles. But chicken paprikash varies from region to region and family to family. This Croatian venison goulash recipe or gulaš is from chef Julia Jaksic, a New York City chef of Croatian-American descent. She likes to serve this stew over a bed of polenta or palenta in Croatian (or mamaliga in Romanian), but mashed potatoes or egg noodles work just as well.